More than 60 years ago, Dionysis Arvanitakis left Greece to find better life in faraway Australia. He grew up destitute in Peloponesos and after difficult times there, his family chose to emigrate when he was a teenager, where eventually he became a pastry chef. In 1970 after saving enough money, he returned to Greece and moved to Kos, native island of his wife Evangelia, where he opened his own bakery. He and his son Stavros have since grown the business to seven locations, now the largest bakery on Kos. Despite his success— Arvanitakis hasn’t forgotten his humble roots and the years of deprivation he and his family suffered as economic migrants themselves. 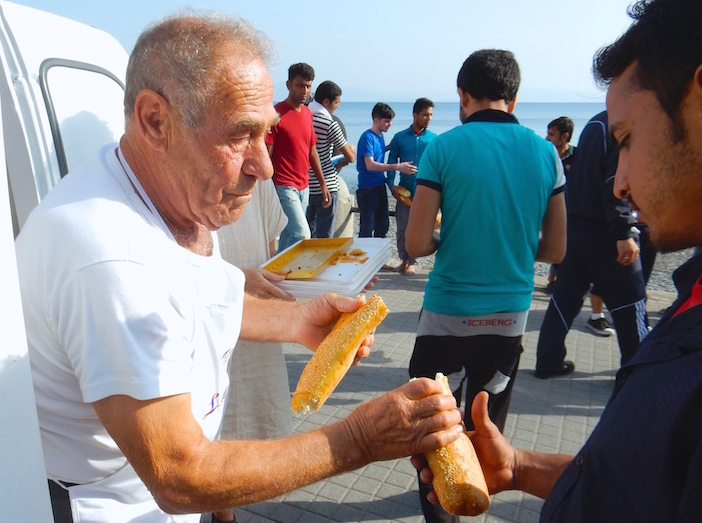 Today, the good baker spends much of his time and money helping the thousands of refugees passing through Kos. A few hundred yards from the famed Oriental Plane Tree where islanders believe Hippocrates taught his medical students the ethics of how to care for others, Arvanitakis parks his bakery truck and begins distributing dozens upon dozens of loaves of bread that he has baked. 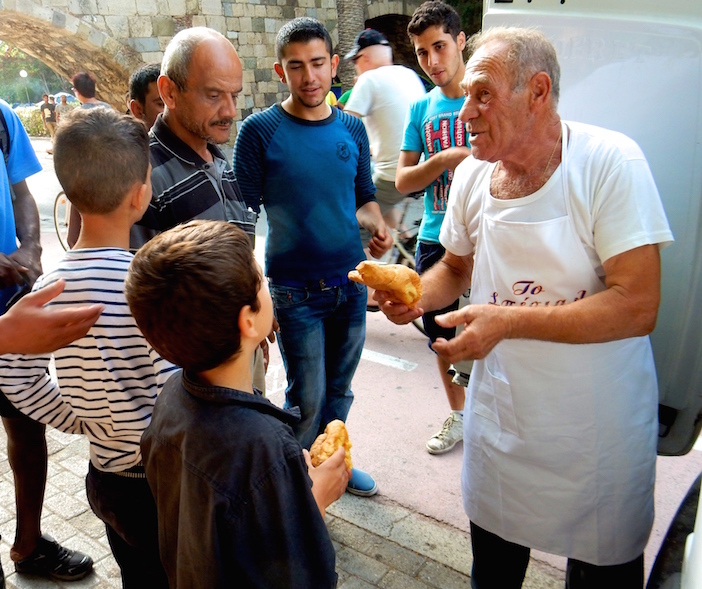 Every morning he orders his bakers to bake an extra 200 pound of bread— bread he will share from his own hands with the dozens (sometimes hundreds) of refugees arriving wet, thirsty and hungry from their journey. The humanity of Dionysis Arvanitakis caught the attention of officials in the European Union and made it to European Commission President Jean-Claude Junker’s attention recently. The Pappas Post has recently embarked on a fundraising endeavor to “support those supporting the refugees.” There are dozens of people and organizations throughout Greece who, although facing their own financial and economic stress, are involved in superhuman endeavors to help those arriving in Greece en route to other European countries. Please consider sharing and/or supporting this campaign. 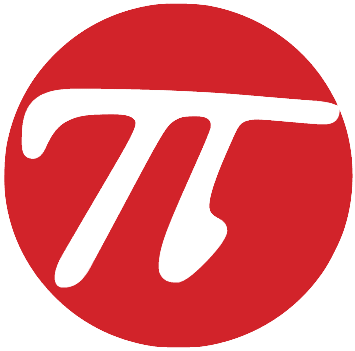 Click here to donate and see the campaign details.